Did you know that March is National Noodle Month? Neither did we! We almost missed out on celebrating this ancient and fantastic food! In our humble opinion, noodles may be one of the world’s most perfect foods. They are the base for recipes from China to Italy and can be savory, sweet, salty and more. Today you can find noodles to suit every taste and inclination. There are zucchini noodles, gluten free noodles, cellophane noodles, flat noodles, thin noodles, long noodles, short noodles, so many noodles! Read our Ancient Noodle post below to learn about the noodle’s fascinating history and scroll down for a yummy zucchini noodle recipe. 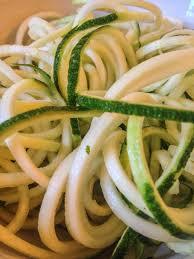 Cut zucchini into thin, noodle-like strips (you can use a mandolin, food processor, or vegetable noodle maker). Toss with the 2 teaspoons salt, and place in a colander to drain for 30 minutes. Heat butter or margarine in a large skillet over medium high heat. Add zucchini; cook and stir until just tender, about 5 minutes. Season to taste with salt and pepper. Sprinkle with Parmesan cheese. This entry was posted in Blog, Bon Appetit Wednesday, Culinary, Culture, Holidays and tagged ancient food, ancient history, ancient noodles, AntiquityNOW, Bon Appetit Wednesday, National Noodle Month, Recipes with a Past, zucchini noodles. Bookmark the permalink.